When B&N launched its new author services website last November, I speculated that the over-priced packages offered on that site were actually provided by the notorious vanity press Author Solutions. I couldn't find a clear link, and B&N wouldn't discuss the topic (even though I kept asking), but now I have proof. If you can't see it, the last line says that the mailing address for Nook Press Author Services is 1663 Liberty Drive, Bloomington, Indiana. That, folks, is the home office of Author Solutions. Barnes & Noble hasn't publicly disclosed this connection in the press release, the publicly available ToS, or in the FAQ (I looked, and so did many other people). They also wouldn't respond when I asked back in November who was providing the new services. I do see why B&N avoided telling us the truth; Author Solutions has well-deserved reputation as a scammy vanity press which sells sub-standard and over-priced services and then pressures authors into buying useless marketing packages. ASI is so bad that it was sued in 2013 by several authors it scammed. In spite of ASI's best efforts, that lawsuit lives on and was just certified for class-action last week. Both cited individuals report directly to Author Solutions CEO Andrew Phillips. Folks, B&N isn't just ripping authors off; they're also pimping authors out to a known scammer. And it gets worse. Given that B&N has already gotten down in the muck with Author Solutions, do you really think they won't take the next step and sell their client list to the publishing industry's equivalent of a Nigerian prince? If you can believe that then I have a bridge to sell you. Hmm. I’d been thinking about pulling my books off Nook Press and distributing to B&N through Smashwords. This may hasten that decision. Take a look at Draft2Digital, Juli. They distribute to B&N, Apple, several others. Bridget, I’m already with Smashwords for other channels and not unhappy with them. D2D doesn’t yet have Oyster, and I’ve had enough Oyster sales through Smashwords to stick with them. I’ve thought about going with a combination of Smashwords and D2D, but that’s just more work than I want to deal with right now. FWIW, I like Smashwords and they generally do a good job. They are running their big (author supported) yearly sale this week, which provides some visibility for authors. Mark Coker works very hard on behalf of the company and authors. They aren’t perfect and have had some bumps in the road, but overall they are excellent. Between this and the other post you posted today about Nook…I swear. You’d think someone from the inside was trying to sabotage the company. They are doing everything possible to stuff themselves down the drain. All very amusing and predictable. How we indies love to jump up and down on our pet whipping boys, B&N and Author Solutions. And now they’e both caught in bed together. it’s like our birthday and Christmas rolled into one. To take one example: Nook Author Services are selling unwary wannabes a cover for their book at $249 for a starter and $525 for an elite cover. Utterly outrageous! Let’s all scream “Scam! Scam! Scam!” It makes us feel so much better. But maybe we should be thankful that unwary author didn’t go to another well-known author services provider that is charging even more. How does $399 for a basic cover grab you? You want the “premier” cover design package? Certainly, Sir. That will be $599. And this for a bog-standard stock image chosen by them, not you. The basic cover gets you one round of changes, not inc. stock image. Pay top whack and you get two rounds of changes, not inc. stock image. Any further changes after that and, surprise, surprise, new fees kick in. Want help with the blurb and choosing keywords and your BISAC category? They will help you choose five whole keywords, help write your blurb and even help write your author bio. And then to crown it all they will look down the list of BISAC categories and choose the one you need. And all for just $249. Suddenly Nook’s Author Services don’t seem such a rip-off after all. Which author services operator is charging more than Nook for its cover design and is charging $249 to help you choose what category your book should be in? Ì’ll tell you what’s amusing and predictable: that Mark Williams would come out and defend Author Solutions by trying to say Amazon is worse. Because I am talking to Mark Williams, right? The same Mark Williams that was hired as “blogger-at-large” for Ebook Bargains UK to drum up traffic for their site? The same Mark Williams who has a personal beef with Amazon? Anyway, your analysis is laughable, but I’ll bite. The example of cover design is misleadingly selective. Let’s look at editing. At a quick glance, prices “from $399” seem extremely competitive. Only that’s not for actual editing, but for an Editorial Assessment – basically a tarted up beta read. The cheapest actual editing they offer is Line Editing at $0.037 a word – working out at $3,700 for a 100k book. If content editing is what you need, the price jumps to $4,400 or $5,300 for something called content editing plus. Developmental editing jumps to $8,100 for a 100k book. But wait, there’s a catch. Because there’s always a catch with Author Solutions. You can’t just purchase the kind of editing you want, you have to take the Editorial Assessment first, and then Nook Press Author Services will determine what your book needs. Which is to say Author Solutions will decide what kind of editing your book needs. Author Solutions. And there’s another catch. A scammier one. Because this is how Author Solutions works. If you read the documents filed in the class action, you can see the central role of the editorial process in scamming authors out of thousands (more) dollars. 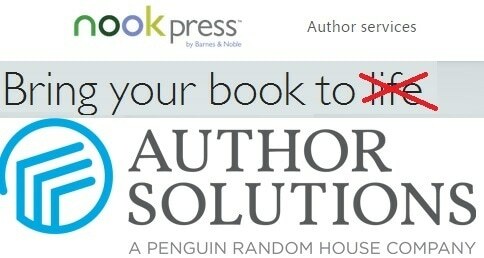 Author Solutions is very slick and knows exactly which emotional buttons to press. I’ve seen their pitches, I’ve talked to their staff, I know how they operate. Just before a customer’s book is published, a “publishing consultant” or “marketing consultant” contacts you to share the exciting news that your book has won a Rising Star award or an Editor’s Choice award. Author Solutions knows that this plays on newbie’s self doubt and need for validation. The only problem is that Author Solutions can’t actually give you the award unless you purchase a marketing package – and, of course, that’s some useless crap like Hollywood pitching or Youtube advertising. This is where they really make their money, and this is what makes it really scammy. This is what enables Author Solutions to convince its customers to spend $5,000 each on average publishing their book. This is why two-thirds of Author Solutions’ income comes from selling crappy, worthless marketing packages. And this is why Author Solutions is facing a class action for deceptive and fraudulent practices. But do explain to me again how this is Amazon’s fault. I enjoy the contortions. Your comparison might be valid, except that Amazon/CreateSpace provides a market for its customers/suppliers to sell their books in. B&N/Nook Press explicitly does not do that. Sorry, I don’t enjoy jumping up and down and knocking anyone. I’m dismayed that Nook didn’t try to offer a sound product at a fair price that would make me want to try them out. In essence, they offered a non-starter, not a competitive advantage. No one here was lauding Createspace that I saw. Createspace has long been there and added services as its grown. Do they overcharge for the basics? Sure. Can you go elsewhere, do your own and upload your book without using those services? Yes. But if Nook did this to gain market share and dollars, they are going to have to try a whole lot harder. Createspace doesn’t have an ongoing class-action lawsuit against it. Createspace doesn’t have all of the author groups lined up in opposition. Createspace doesn’t have other companies acting as fronts. LOL! EBUK is not a one-man show, David, but yes, I do write some of the blog posts and some of the comments, as this one. And no, neither I nor they have a beef with Amazon. EBUK is, I think, the only ebook promo site with a Kindle Unlimited newsletter. As an author my titles have been in Select, in Amazon’s White Glove programme and considered for the Amazon imprints. I’ve had issues with Amazon in the same way as I have had issues with other retailers like Smashwords, Kobo and OverDrive. No beef with any of them. Problems happen. Life goes on. The EBUK posts I write constantly stress Amazon is the single most important entity out there for most indie authors. EBUK has on occasion been critical of Amazon, but also of numerous other retailers and service providers. I’m not sure where you get the idea I am defending Author Solutions. I was merely equating the package prices of Nook and CreateSpace, based on the data made available on their respective web pages. In both instances they are businesses out to make money. We live in a capitalist world. Law-suits are indicative, but Amazon itself is no stranger to law-suits, many claiming it is scamming its customers. But I only raise these here to counter your point, not because of any personal beef with Amazon. David, first you’ll need to show me where I said the first time it was Amazon’s fault. No such words were written by me. Just for the record, David, EBUK do not “hire” me. EBUK is a not-for-profit operation helping indie authors explore the global markets and opportunities while using any proceeds to help children here in West Africa. Right. You have no beef with Amazon. And yet you are trying to make this all about Amazon when it is nothing to do with Amazon. My post is entirely based on documentary evidence – not allegations – namely: the contracts between authors and Nook Press Author Services, the privacy policies of Nook Press/B&N, and the depositions, under oath, of Author Solutions executives. You have focused on a false comparison between Author Solutions and Createspace. I have shown why that’s ridiculous. I’m not sure what else there is to say. I think your position here is pretty clear. Hmmm… You do realize that most of us know ‘not for profit’ does not mean charitable and are able to figure out that ‘while using any proceeds to help children here in West Africa’ means proceeds after salaries come out. Exactly what is the percentage of the gross that goes to those children? I am willing to bet you don’t want to divulge that little tidbit. This kind of nonsense has been used for at best questionable ‘fund raising’ for decades, so don’t use it on people with a brain. And you still didn’t answer a single one of the points in David Gaugran’s post.